and focus mainly on nutrition and diet and obtained her Bachelors of Science in Holistic Nutrition. She now has a diet and nutrition coaching practice in Seattle and helps motivate people to eat healthier, be more active and slim down as result. 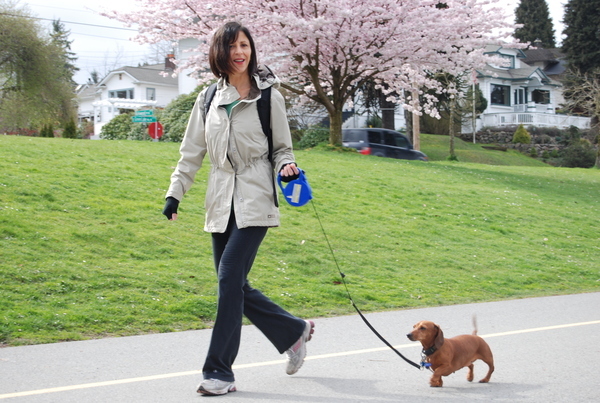 She lives in the upper Queen Anne district of Seattle with her 7 year old rescue doxie, Sienna. Debbie stays in shape by making good food choices and going on long walks with her half as tall and twice as long weiner dog. In addition to long walks together, they now are on a mission to prove that even little dogs are capable of going on long vigorous hikes including Mt. Si. Debbie is passionate about animals, nutrition and helping people achieve their weight loss goals. She is available for consultations by phone or in person and can be reached at 415-420-1002. Thanks for reading my blog! I was happy to read your post because I probably never would have stumbled upon your blog on my own. I just started to read your home page and immediately subscribed because 1) I like your writing style and perspective and 2) punk/new wave music was a big part of my life in the late 70s and early 80s so I’m excited to read more. As for dieting, my intent is to share my knowledge so that folks will see it’s really not that complicated. Know the basics, do everything in moderation and the rest will come easy. It’s about making choices and that’s what I am going to discuss today. I love your blog. Learned so many new things about food and eating that I wasn’t aware of. And I dig your writing style and sense of humour. Thanks Mollybird, I appreciate the compliments. I have so much to share and just getting started. She is a little cutie! I wish I lived in Seattle, I could use your help losing weight. I have been a regular on your blog for a while now and I find it very informative and interesting at the same time (kudos on attaining that difficult combination with such ease). I have a request – I fractured my leg recently. I had a fracture same time last year too and I had put on some weight while I was resting. So, can you please suggest some diet that will help me stay slim this time. Also, with such frequent fractures, I have doubts about the calcium in my body. I do eat healthy, but evidently it isn’t enough. What exactly is a calcium rich diet? Sorry to hear about your recent fracture? Has your doctor run a complete blood panel to check for deficiencies? That’s always recommended. Have you lost a significant amount of weight prior to the fractures? The RDA for calcium is about 1,000-1,200 milligrams. The best sources for calcium are dairy products and fortified cereals and orange juice. Now this is just my opinion but I don’t recommend a lot of dairy in the diet (nor do I like the fortified cereals or orange juice because they are generally too high in sugar.) I will go into this in more detail in the future but basically foods fall into two categories…acid and alkaline. Some acid forming foods are meat, sugars, eggs and dairy and most grains. If you eat a lot of acid forming foods the body needs to buffer that and if you don’t eat enough alkaline forming foods (fresh fruits and vegetables are alkaline) then your body will leech it from your bones. Not a good thing obviously. Now for calcium to be absorbed you need to also have magnesium and vitamin D present. Good sources of magnesium are nuts, flax, molasses and bran. Vitamin D is present in fish eggs and fortified cereals and you absorb it through your skin when you sit in the sun. So as you can see unless you eat a wide variety of fish, vegetables and fruits and or fortified cereals it’s hard to get enough calcium, vitamin D and magnesium. Do you drink a lot of soda? Phosphorus also leeches calcium from your bones. Phosphoric acid is a main ingredient of soda (diet or regular). I am not that fond of taking supplements but I don’t drink milk or eat fortified cereals and I live in Seattle so I do a multi vitamin (that is from food- very important) and I also take a calcium/magnesium supplement and also a Vitamin D supplement. The calcium/magnesium supplement I like the best is http://thorne.com/Products/Minerals/Calcium/prd~M222.jsp and I supplement with additional vitamin D.
Additionally Supplementing with omega-3 fatty acids to reduce inflammation and protect muscles and connective tissues is also a good idea. As for diet, I don’t recommend a diet that is too calorie restrictive. Basically if you stuff yourself with fresh vegetables, lean protein like fish or turkey and some healthy carbs (like brown rice, whole wheat bread or pasta but not more than 2 cups a day you can lose weight effortlessly. It will be slow, maybe 1-2 lbs. a week but it is more likely that you will keep it off. I wish there was a magic bullet and of course if you starve yourself you will lose weight faster but I don’t recommend it. Best of luck to you and let me know how you do. Good advice Jess. I also try and drink 1-2 tall glasses of water before each meal but it depends on the circumstances for obvious reasons 😉 I’ve never tried this but I suppose one could try asking the restaurant to give you a half or children’s sized portion. Not sure if they would do it though. Thank you so much for your response, Debbie. I took a print of your reply and I am going to make the changes you suggested. There are quite a few areas that I could work on. I live in a hot place and I never realised that I had been drinking a lot of cola. Already started on the supplements. This time, I will make healthy eating a habit for sure. Just cutting out the soda and replacing it with water should make an impact. Try not to replace it with juice unless its fresh vegetable juice. Best of luck to you!